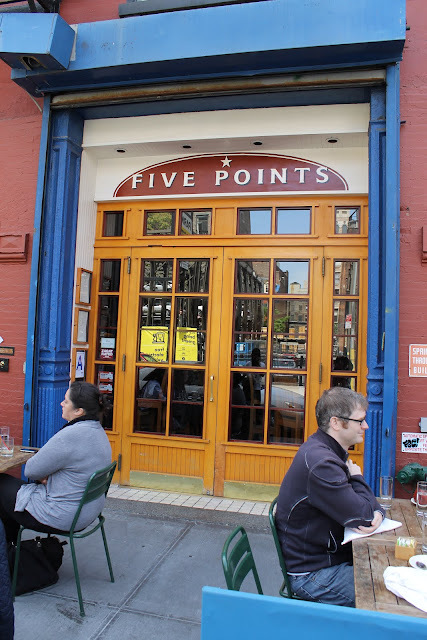 The best thing about Five Points is their lemon-ricotta pancakes. The second best is that the restaurant takes reservations. Our reservation was for 12:30pm on Saturday, and the restaurant was already quite packed by the time we arrived. There is some outdoor seating in front of the restaurant. High ceilings and a row of trees dividing the dining room in half. At the very back of the restaurant, there is a skylight and a few round dining tables. Churros with Mexican hot chocolate, $12. (You can also order just churros for $8). These churros came out very hot and not too dense. So delicious. Lemon-Ricotta Pancakes with Vermont Maple Syrup, $13. Absolutely fabulous pancakes. As much as I loved the lemon pancakes at Leopold's Kafe in DC, these pancakes take the cake. Light, fluffy, and such a strong lemon flavor that you can smell it before it even reaches your mouth. Angry Skillet, $15: roasted yellowfoot mushrooms, rye berries, goat cheese, melted leeks, hot jam. There was plenty of goat cheese in here, which I liked. Apparently the hot jam is very spicy, and my friend could taste it even after she scraped it off. Breakfast Sausage Benedict, $15: poached eggs, cheddar scone, crawdaddy hollandaise. Using scones in eggs benedict is genius. These were so dense and flavorful. The sausage was really tasty too.